SAN DIEGO, Aug. 13, 2018 /PRNewswire/ -- United Airlines today debuted United Corporate Preferred, the industry's newest corporate travel program designed to offer top travel benefits to the airline's most loyal business customers. United announced the new program this morning at the Global Business Traveler Association (GBTA) Convention in San Diego. United Corporate Preferred is a new and exclusive benefits program that provides added perks for the airline's top corporate customers. A multi-level program, United Corporate Preferred offers escalating benefits at three levels, including United Corporate Preferred, United Corporate Preferred Plus and United Corporate Preferred Elite. Eligibility for the new program is determined by a corporation's contract status, revenue contribution and loyalty with United. Eligible corporate agreements include United corporate share agreements, United PassPlus and United Meetings. "Every day thousands of road warriors are jetting off on United to work events and business meetings all over the world," said Jake Cefolia, United's senior vice president of Worldwide Sales. "We designed our United Corporate Preferred program with the customer's entire travel experience in mind, from booking to landing, to identify opportunities to show our appreciation to our loyal business customers with a program that offers extra perks and travel benefits." • Preferred upgrades – tie-breaker preferences for upgrades. • Preferred standby – prioritization when traveling on standby for a different flight and when waitlisting for a seat in a different cabin or booking class. • Operational adjustment protection – protection during travel interruptions, as well as seat protection to retain the same or similar seat in the event of an aircraft swap. • Preferred discounts and offers – eligibility to receive exclusive promotions offered by both United and its partners in the near future. • Additional travel waiver flexibility – when United has a travel waiver in place, customers will receive additional flexibility to adjust their travel beyond restrictions in place on the standard waiver. • Preferred boarding – later this year, customers will receive priority boarding in group two. • Preferred seating – later this year, customers will have access to book designated standard economy seats closer to the front of the plane. To receive these benefits, tickets must be flown on United or United Express flights, reservations must include the customer's corporate account number at the time of booking, and the travel must be for the corporate customer's business. Companies invited to participate in United Corporate Preferred will receive a tailored webpage with information on benefits eligible to their employees. For more information on the program, visit unitedcorporatepreferred.com. 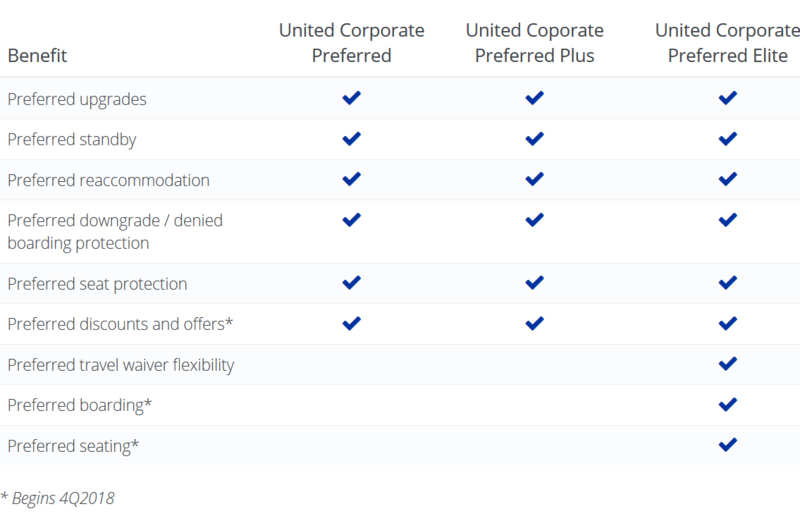 What benefits do United Corporate Preferred travelers receive? Specific benefits are listed below. Being a multi-level program, within each benefit in tie-breaker scenarios, United Corporate Preferred Elite travelers receive the highest priority, followed by United Corporate Preferred Plus and then United Corporate Preferred. , the $9 "preferred seating" are available for free at T-24 check-in. Not much here for Gold and above, though I can see the Preferred standby, Preferred downgrade, Preferred reaccomodation and Preferred seat protection may come in handy, particularly as I have often been shafted on equipment swaps (even as 1K). Excuse me for being a bit skeptical about how this will play with other elites. Presumably GS and 1K will continue to be prioritized, but never found that to be the case as Gold or below. Unfortunately it appears that these perks only apply through tickets purchased the corporate portal, not for personal tix which would be more valuable to me during IRROPS. I see this mainly as benefitting new employees that start with NO status (like me a decade ago) - they will get preferred boarding and seating which will be nice when traveling domestic economy and maybe some better protection during IRROPS. .
.... I see this mainly as benefitting new employees that start with NO status (like me a decade ago) - they will get preferred boarding and seating which will be nice when traveling domestic economy and maybe some better protection during IRROPS. . Yes, that seems to be the intent when it was rolled out -- a pseudo status level for those without status -- acknowledging that no status, late booking corporate flights get expensive tickets and lousy position of the totem pole (and lousy seat selection). Also for those use to status on another carrier, this allows UA to be a bit more attractive and perhaps winning some future business. As a general note, if this corporate program starts impacting Gold or higher elites, UA has a lot to lose. UA is going to be less concerned about pushing no status folks further down the list. It is the corporation that UA is targeting. I have an award booking made by Lufthansa Miles & More program for domestic flights on United in economy class in August. I have a Lufthansa Star Alliance Gold (Senator) status on Lufthansa. Am I eligible to chose Preferred Seats free of charge? I'm asking because I was assigned a Preferred Seat 22D free of charge at the time of completing the award booking on both UA flights. While 22D is still assigned for one of my award flights, on the other flight my seat was changed by United the other day from 22D to a regular economy seat 27D. I don't understand. Even if you are eligible for a preferred seat, one may not always be available. These seats may open up later on though and be available for selection. Note there is nothing special about the "preferred" seats. They are just closer to the front of the aircraft. Only E+ seats have more legroom. Yes, I know what the preferred seats are, LH/LX call them the same way, but unlike UA they cannot be bought, preferred seats on LH/LX can only be selected by status passengers (LH Gold), or they become available to everyone when the check-in commences. The preferred seats ARE available, and there are plenty of them. Perhaps I wasn't clear enough about my question. I was wondering why I was moved out from my preferred seat on one UA flight while the preferred seat on another UA flight was kept. Both flights are domestic UA. The aircraft has not changed. It is an award booking on the phone with LH Miles & More, I was assigned the preferred seats on both flights at the time of the booking (so I assume I was eligible). Anyway, I called UA. The assistant first told me preferred seats are paid seats and was really surprised I got the seat when I made the booking. She claimed my status is irrelevant. After I pointed out I still have a preferred seat on another flight in the same reservation, she was puzzled and put me on hold. After 2 or 3 minutes on hold she said she got me back to the preferred seat. No explanation though, so UA rules are mystery to me. I wouldn't waste ten seconds of my time trying to get a "preferred" seat, given they are physically no different at all from regular economy. Correct, the idea of preferred seats is not about being physically different from economy seats. I wouldn't want to waste minutes of my time waiting to get off the plane when connection is tight though. Most UA agents and even supervisors have near zero knowledge of UA rules. That's just the way it is. If you get a MOLA, just call again. I had some bad experience even with 'executive' agents who still pretty just do what the computer tells them with a little bit more wiggle room to override the system. Just to be clear, do you work for a Corporate Preferred company, and was this ticket purchased through your corporate travel agency (ie, with a relevant tour code) and on 016 stock?